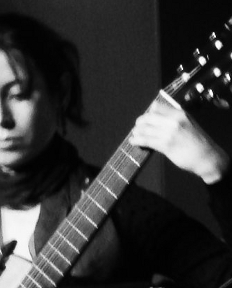 Spanish classical guitarist, Teresa Garcia Herranz began her explorations of the music world at age 5. Her love of travel has led to a strong interest in cultures and traditions from around the world. This can be found in her diverse choices of music projects that includes folk music, chamber music as well as productions that intertwine music with various forms of art such as photography, painting, video, theatre, etc. Even though her specialty is classical guitar, Teresa enjoys playing "Classical Music" that interconnects traditional with contemporary music.